Troop 29 is committed to offering it's older scouts opportunities beyond traditional camping and guaranteed to offer them the personal challenges they are seeking. Each year we strive to offer one 'Regional' High adventure activity, and one 'National' High adventure trip. Adventure activities vary based on scout interest, but we try to rotate between the BSA National camps taking each in sequence. Spend 4 nights in the famous Appalachian Mountain Club huts along the AT in the White Mountains of New Hampshire. Help the AMC hut “croos” with a service project or trail maintenance and speak with an AMC naturalist/geologist. While on the trail, visit the summit of Mount Washington (the “Home of the World’s Worst Weather”), get a tour of the Mountain Washington Observatory (where the highest wind ever observed by man (231 mph) was recorded). Learn the meaning of an “alpine start” when hiking, then spend a day rockclimbing on natural crags in North Conway New Hampshire with the AMGA Certified Guides of Eastern Mountain Sports’ Climbing School. Finish up with a day’s canoe paddle on the Saco River in Maine. Depending on timing, we may have a day to sightsee in the Mount Washington Valley. While we will not need to carry food, stoves or tents while on the trails, we will need to pack for every type of weather contingency, and participants should expect to carry a backpack. It is not unusual for the weather to change suddenly including rain, fog, cold or even snow (yes, even in July). Most of the hiking along the trail will be above tree line. Sun, sand, snorkling, scuba....need we say any more????? Probably not, but we'll offer a few more details anyway! We're looking for up to two crews to explore the deeps this summer. Scouts 14 and older are eligible (check out specifics in link below). With a trained dive instructor aboard to assist us on this adventure we will be spending our days not only scuba diving, but sailing around the Florida Keys. With a crew size of 10 to 12 people, a home that will transport us from reef to reef on a 57-foot schooner or 2 40-foot sailing yachts. During this adventure (weather permitting) you will get to dive 11-15 times, including one or more night dives. 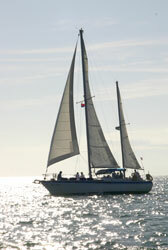 When you are not diving there are opportunities for sailing and fishing while cruising through the Florida Keys. PRIOR SCUBA certification is required. If needed the Troop will recommend a certification program. You MUST be a STRONG Swimmer with Swimming Merit Badge. Eligibility *Note also requires Scoutmaster approval. Hitch 'em up and hike 'em out! Trekking . . .in the Rockies. . . across the back country . . . in high mountain meadows bustling with wildflowers . . . by sparkling silver streams wandering through cool green glens . . . on red stone ridges cutting cobalt blue skies! Philmont . . .Scouting's paradise . . . 215 square miles of rugged wilderness in New Mexico's Sangre de Cristo range of the Rocky Mountains. Each year, tens of thousands of Scouts from all over the nation discover the experience is an opportunity of a lifetime. Many will say years later . . . Philmont changed my life! There is much to Philmont. But when most people hear the name, one thing comes to mind: backpacking. The backpacking treks are a part of Philmont's High Adventure Programs, and Philmont offers a wide variety of them. Each program brings with it a different set of challenges and requirements. No two days are alike; no two treks are ever the same; yet the memories of those who have gone are always the same . . .
"I want to go back!" Start preparing for Philmont! Get to Philmont in top physical and mental condition, ready for carrying a 35- to 50-pound pack over steep, rugged trails at high elevations (6,500 to 12,500 feet). The currently suggested summer packing list is posted here: Exercise right up to the day you depart for Philmont! "These properties are donated and dedicated to the Boy Scouts of America for the purpose of perpetuating faith -- self reliance -- integrity -- freedom. Principles used to build this great country by the American pioneer so that these future citizens may through thoughtful adult guidance and by the inspiration of nature visualize and form a code of living to diligently maintain these high ideals and our proper destiny."